"Monoprinting is actually a whole sub-division of printing, that implies the use of a process or mixture of processes to create a unique artwork. 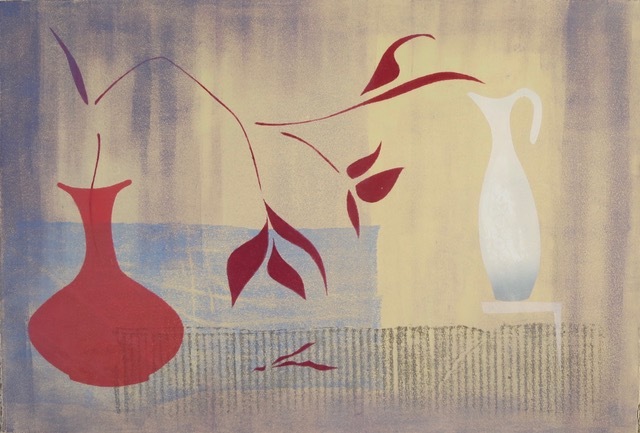 It includes monotypes – which is where a smooth, blank surface is worked on with ink or paint exactly as in painting, using a range of tools. It is then run through a press onto paper or fabric and the resulting printed image is the artwork. This process may be repeated onto the same piece of paper several times, building up layers. The pressure that the printing press applies affects the way the ink appears, and therefore plays a crucial part in the process. 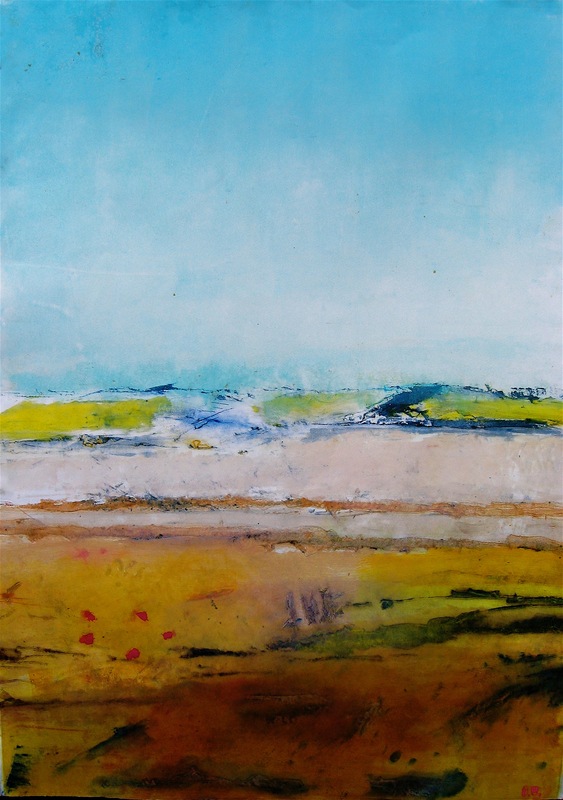 A monoprint can also be made using a block or plate or screen that has an image cut or etched on it. Instead of printing each print from the block to be exactly the same, the ink is applied and wiped in a painterly manner or in different colours, so that each print is a unique variation. These methods can also be applied to screenprinting or lithography. Other monoprinting processes do not use a press at all and depend on hand pressure – these are also versatile and be used with a lot of other techniques"
What’s your favourite type of Monoprinting to do? Why? 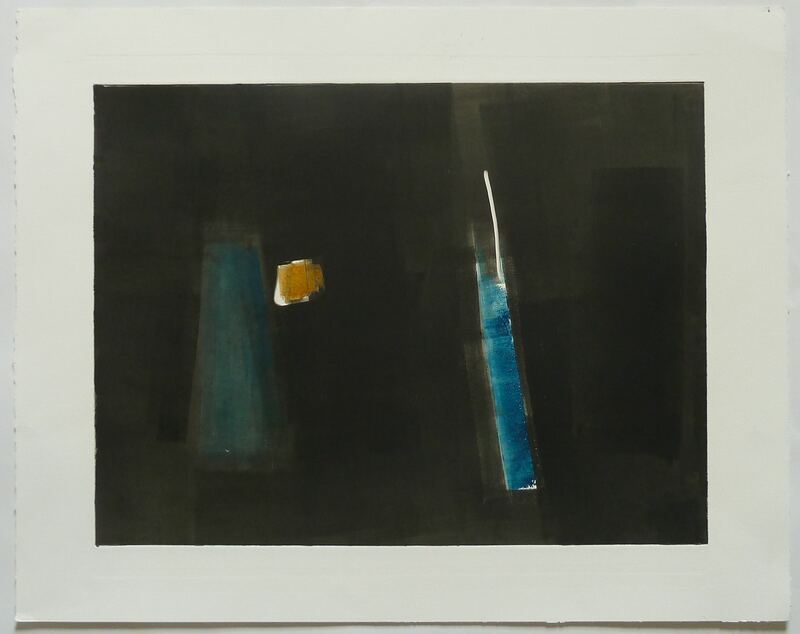 The Tate website says in its definition of Monoprint that “the beauty of Monoprint print lies in its spontaneity and its allowance for combinations of printmaking, painting and drawing media” - would you agree with this? Why (or why not)? Do you combine different Monoprint processes? And/or do you combine it will other forms of printmaking? 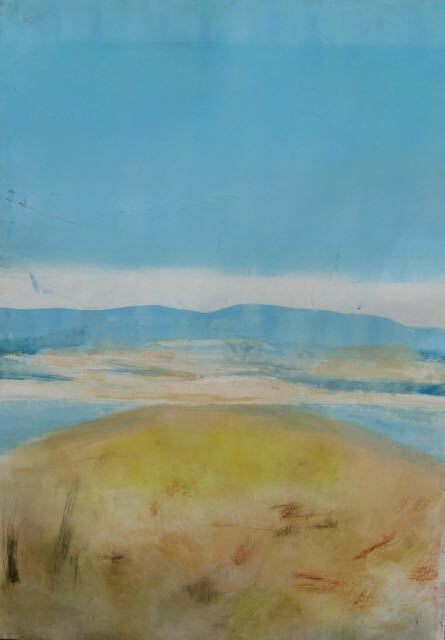 “Monoprinting is an important part of my practice as a landscape painter. I love the directness, freedom and spontaneity of the medium: I can play with abstract concepts, and experiment with colour and shape. I work almost exclusively on plastic plates of varying sizes, using water-based relief printing inks applied with rollers, and removing areas by scratching, wiping and masking off. After printing I then often work on the original plate without wiping, adding more ink, before putting it through the press with the same paper to create a multi-layered print. Sometimes I add to this using chine collè, or simply collage fragments on to the finished print. 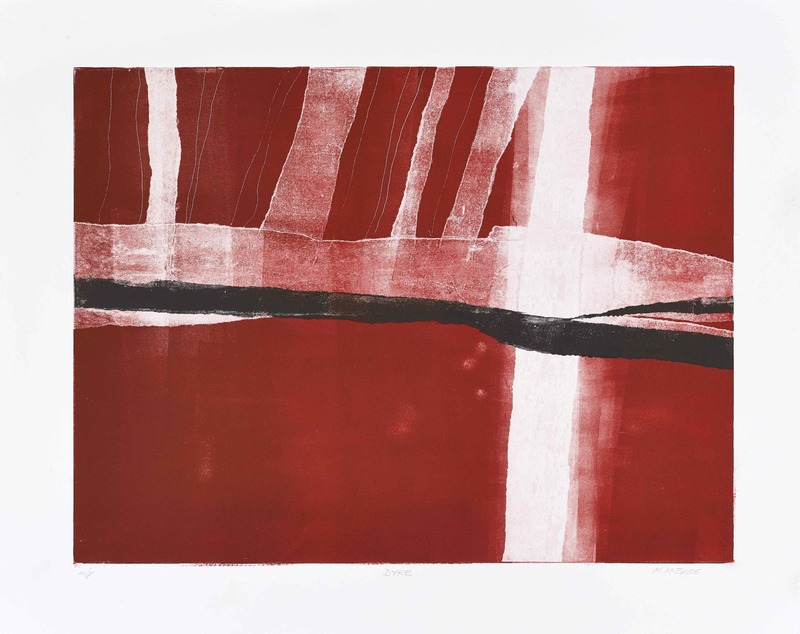 "Combining etching collagraphs and woodcuts because I like the different marks that each produce. 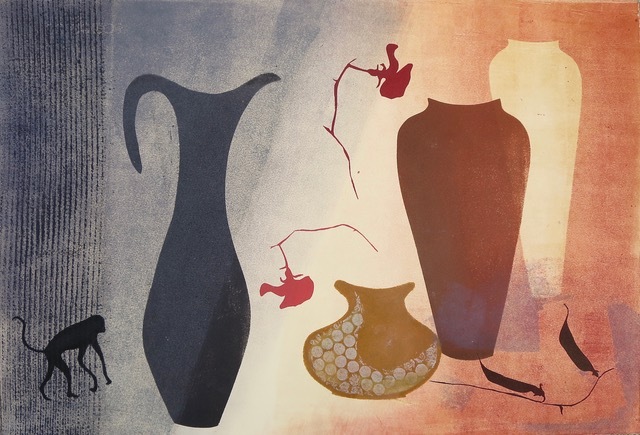 I then can overprint and layer them"
The Tate website says in its definition of Monoprint that “the beauty of Monoprint lies in its spontaneity and its allowance for combinations of printmaking, painting and drawing media” - would you agree with this? Why (or why not)? "I agree with this as it allows the work to form on the paper like a painting. The decisions are made throughout the printing process as opposed to, for example, the etching process." Do you combine different Monoprint processes in your work? And/or do you combine it will other forms of printmaking? "Yes I do. I have a pick-and-mix approach, but normally, I'll start with an etching and over the production of the print I then print the plate or parts of it to strengthen the line several times. I have, in the past, combined screen-printing with monoprinting; the screen-printing was done first as it is waterbased and combined with a 40% gloss medium paint." Thanks everyone! Monoprinting sounds like a fun, creative and versatile process - fancy giving it a go? We offer a range of courses in different Monoprinting techniques: browse our Get Creative guide to see what's on (new edition jam-packed full of courses will be out in December!). Or did you know that you can book private tution with a member of our Print Studio team? Do it yourself or gather a group of friends and spent some dedicated time learning new creative skills - get in touch for more details!